Samsung Galaxy S10 is a perfect blend of aesthetics and technology. The South Korean tech giant put some serious bleeding edge innovations inside the 10th anniversary edition of Galaxy S lineup. The punched hole display, for example, is a technological marvel. Samsung’s R&D department is already working to further improve the current piece of tech, so that more and more sensors can be squeezed inside the display. In 2019’s Galaxy S10, Samsung engineers were able to install the proximity and the ambient light sensors behind the display. Users were initially confused a little to notice a blinking white pixel near the battery indicator. It was later confirmed to be the under-display proximity sensor through. However, the new way of positing the proximity sensor may not adequate to detect all type of surfaces properly. 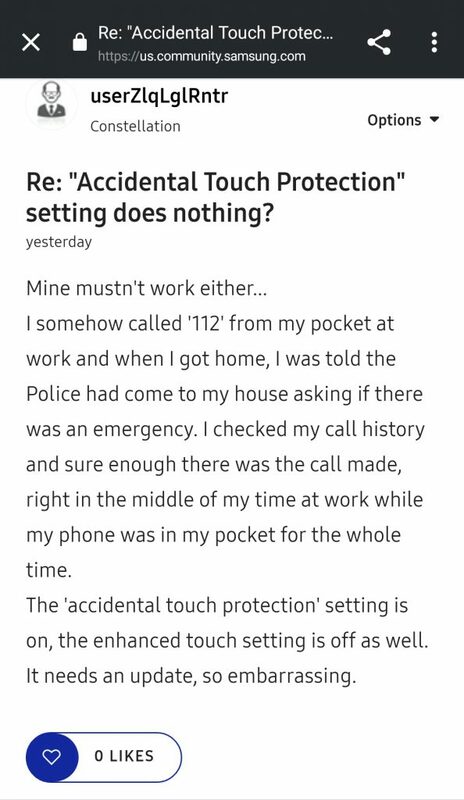 We were the first to report the anomalies caused by the badly tuned proximity sensor and accidental touch protection in Galaxy S10, which created a havoc in the S10 users community. The issues are still hot and trending. Meanwhile, we have spotted a couple of partially similar events. The only difference is, here the proximity sensor is preventing the display to wake up inappropriately. The same user posted about the same issue in various subreddits. 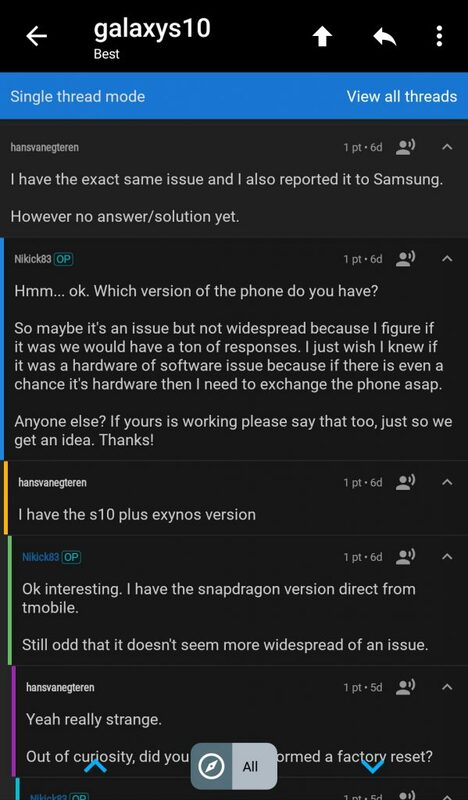 Based on the user responses, it seems that the issue is not just limited to carrier branded S10’s. 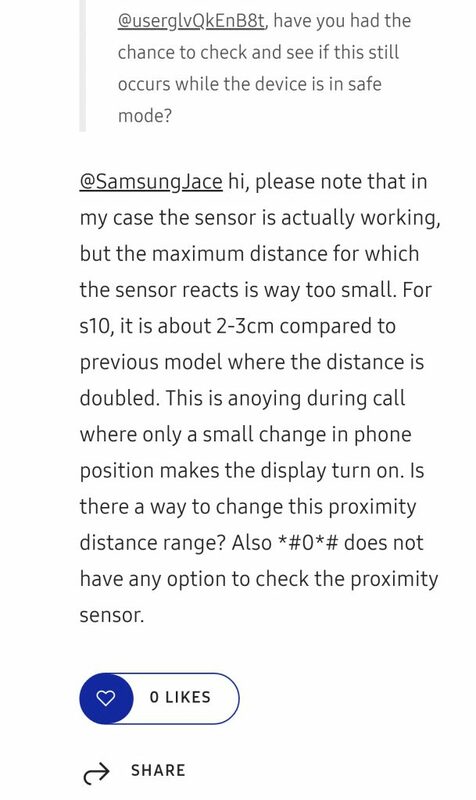 Comment from discussion PH0NER’s comment from discussion "Samsung Galaxy S10+ Odd Proximity Sensor Issue, My phone or software issue?". Also when dialing *#0*# for the test menu’s, clicking the sensors butten doesn’t show any proximity sensor at all? I also removed the screenprotector and the issue happends with both case on and off. Is this a hardware or software defect, or am I missing somthing in the settings? The affected users tried out typical workarounds, like booting to safe mode, removing the screen protector or factory resetting the phone. 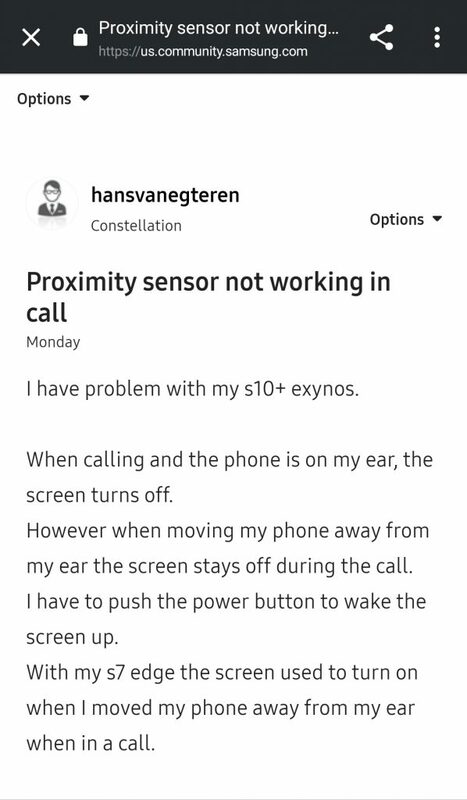 There are reports about delayed actions from the proximity sensor too. I seem to have a problem with the proximity sensor on my new s10+. when receiving calls the screen turns off like it should when I have the phone to my ear but when making calls it does not turn the screen off when lifted to my ear resulting in unwanted screen presses. anyone else experencing this or have a solution please?? Some users noticed that Samsung decided to lower the threshold distance for the proximity sensor to function. On the other hand, playing with the touch sensitivity settings was helpful for some. I had the same exact issue. I turned on the “Touch Sensitivity” setting under the “Display” in Options (Options > Display > Touch Sensitivity) and it seems to have fixed it. It’s also resolved some of the misreads with the inscreen finger print reader. 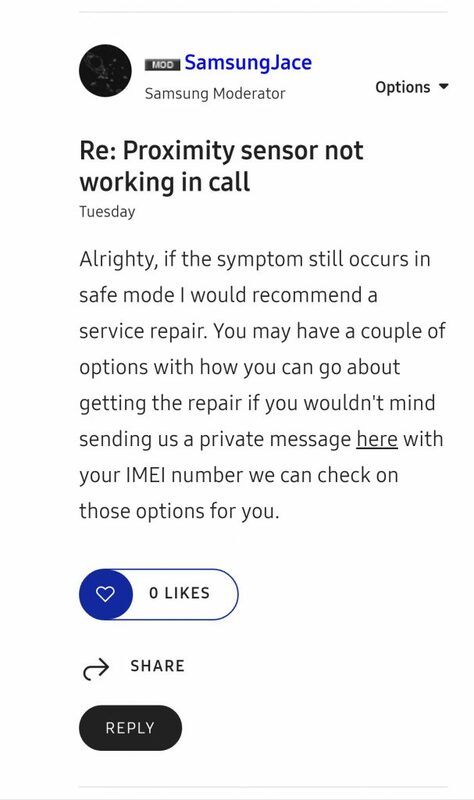 Samsung community moderators are advising to opt for a service repair and/or return, as the issue is presumably less widespread than the previously reported broken accidental touch protection incident. We are still not sure about the nature of this particular glitch. It is difficult to label them as a couple of isolated manufacturing defects or the tip of the iceberg of under-display proximity sensor related issues. As always, PiunikaWeb is keeping a tab on the situation. 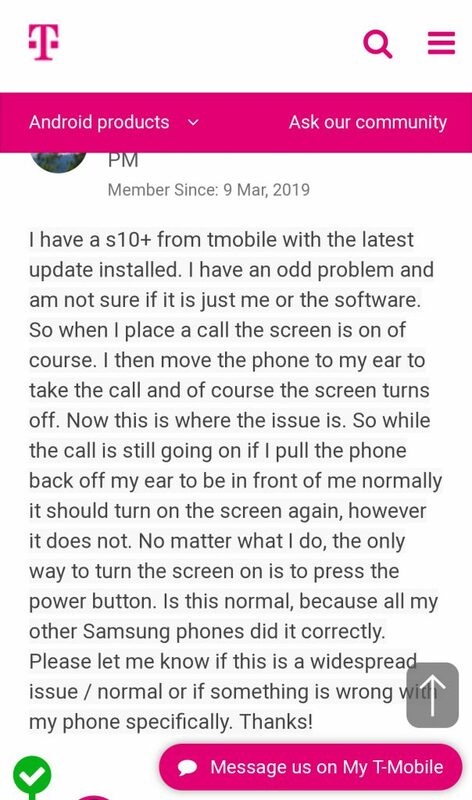 Do let us know if you’re experiencing the same glitchy behaviour with your Galaxy S10. OnePlus News Daily Dose #31: HydrogenOS 3/3T Pie update, OnePlus 7 case leak, mystery phone and more!